In all the excitement and hard work of launching, promoting and running The Noisefloor since March, I’ve failed to complete the story of its construction. So for the sake of completion here is a brief account of the latter stages, after we’d finished the main building work. In the ‘what’s important for you at a music studio’ section, one of the respondents to my research survey said “not smelly”. A fair point considering that The Noisefloor is, essentially, a sealed room in a basement! 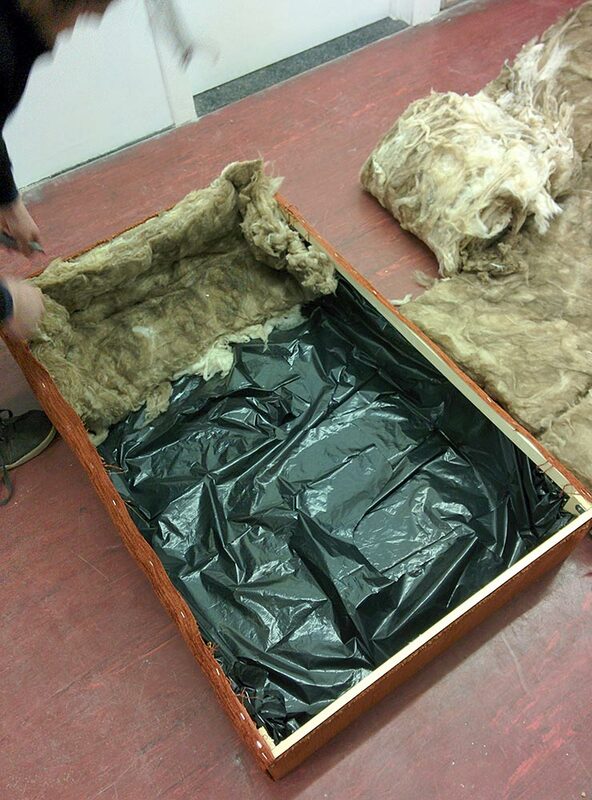 As with everything else, ensuring the soundproofing wasn’t compromised was our main concern. 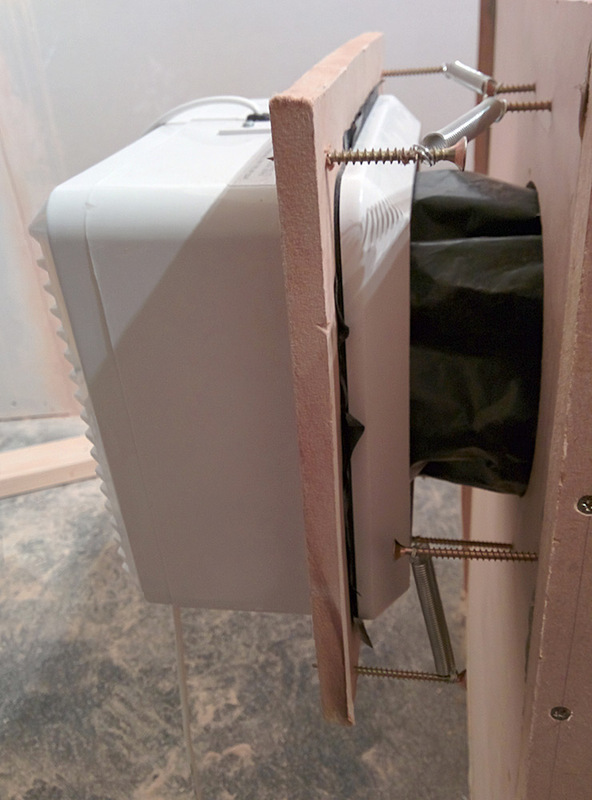 Resident acoustics and DIY expert Ross set about designing a bespoke ventilation system using MDF, foam, netting, polythene, springs and a variable speed fan. He constructed 2 long, wooden boxes which were divided into channels and lined with foam to diffuse sound waves but still allow air to flow. The fan itself was spring-mounted externally to absorb vibrations, and a speed control dial was wired into the studio itself. 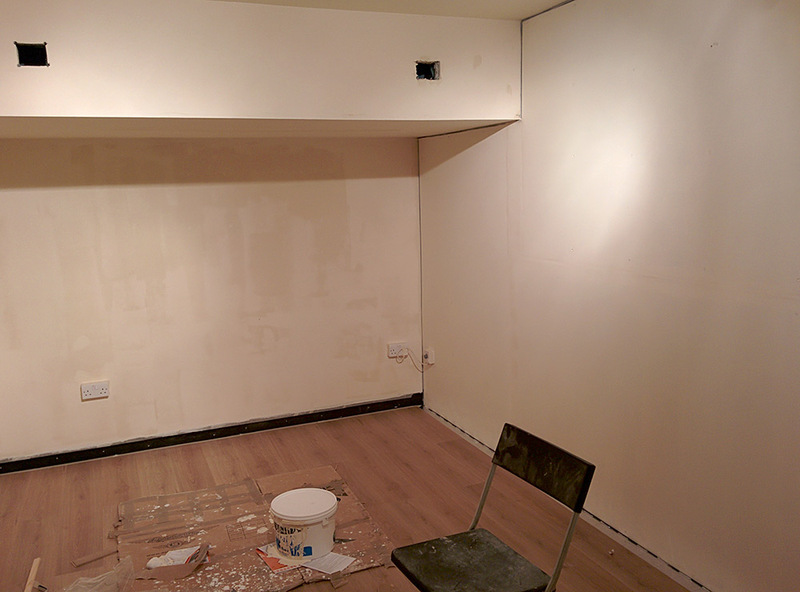 Inlet and outlet vents were cut into the studio walls and the boxes were installed above the ceiling. 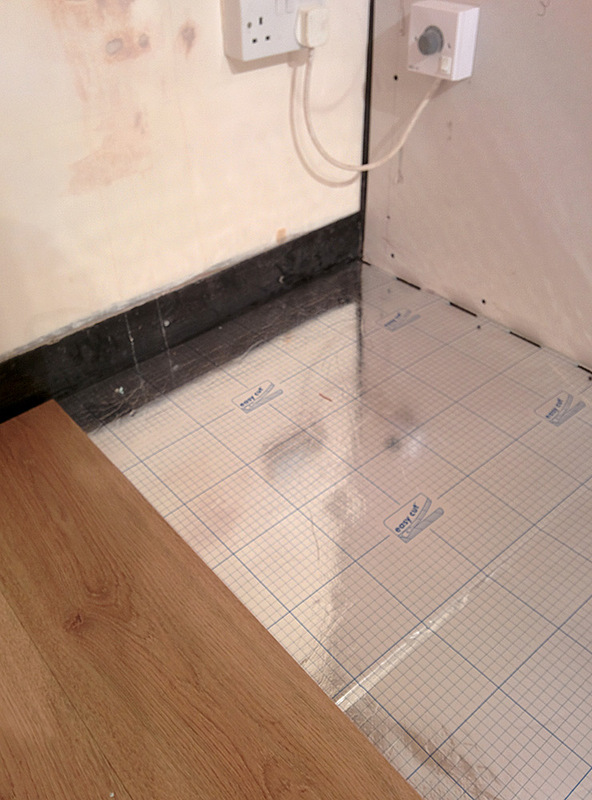 The construction was partly a trial and error process but the system works like a charm – it’s completely silent and keeps the room cool and non-smelly. Ross’ finest hour! After nearly 3 months of dust and clutter the time had come to clear up and start decorating. 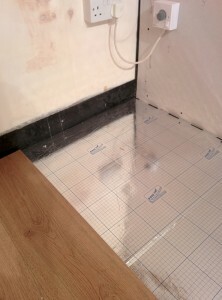 The walls were painted and the floor laid – we opted for laminate with a decent underlay to absorb vibrations and sound. It was amazing to finally see it morph from a building site to a nice, bright, welcoming space! We used rugs to kill some of the room’s natural reverb, which was considerable, but this was never going to be enough on its own. With all the focus on soundproofing I’d almost forgotten that the new space would need extensive sonic treatment to make it a good monitoring environment. 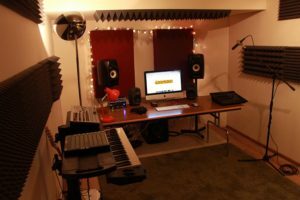 Every space has its own acoustic characteristics, from various types of echo to excessive ringing at certain frequencies, and a music studio needs to sound pretty much dry in this regard. So with the floor laid, walls painted and furniture and speakers in place we settled in for a long night of tests to see what needed to be done. We played a loud signal in the room (a sine sweep from around 10hz to 22,000hz) and recorded the results via a couple of condenser mics. 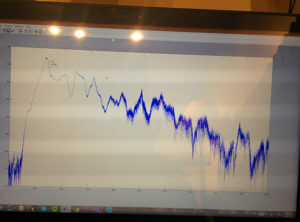 Ross then performed some Fast Fourier Transform-based mathematical trickery to see which frequencies we needed to target. The dimensions of the room meant there were several low frequencies that were proving awkward, resulting in a boomy, unbalanced bass. 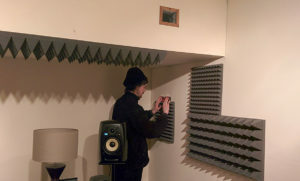 More maths allowed Ross to design bass traps to absorb those specific frequencies. 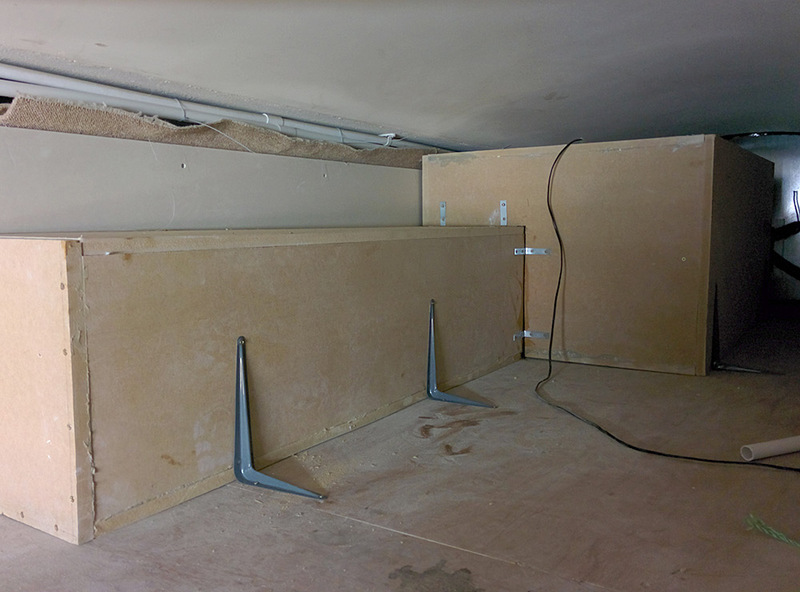 Timber frames were filled with rockwool, covered with fabric and mounted on the walls, and the corners of the room behind the speakers were structurally modified in a similar manner. A few more tests and tweaks soon meant our problem frequencies were safely dealt with. There was still some clearly audible reverb, though, so we experimented with the placement of acoustic foam to eliminate standing waves. 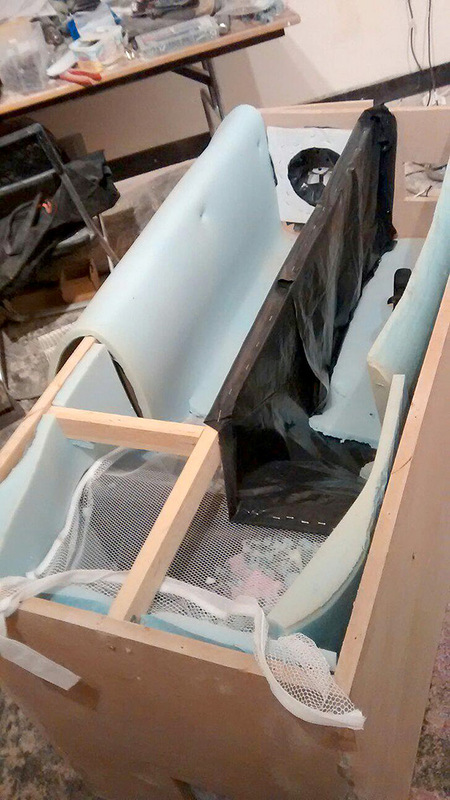 We also treated the area around the console with foam to ensure a balanced listening experience with no unwanted reflections. Before too long the room was sounding suitably dry (although not completely dead – we wanted to preserve a bit of life). Several very late nights and a good tidy up later, the room finally resembled a music studio. It was time to optimise the monitor speakers, so we carefully placed the KRK VXT 6 speakers and 10s subwoofer and tuned them to each other. The sub kicks in below 80hz ensuring all those low frequencies are fully audible. 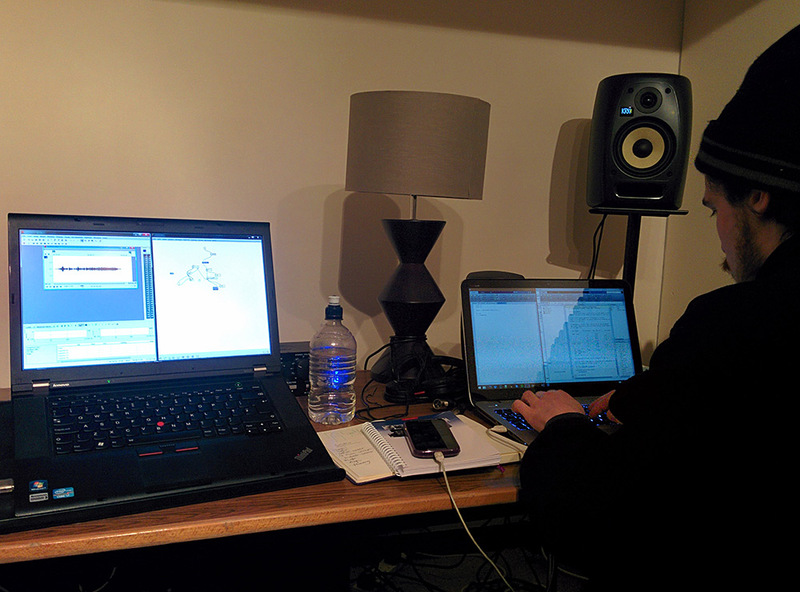 The sweet spot is, of course, the chair behind the workstation, and boy does it sound sweet! 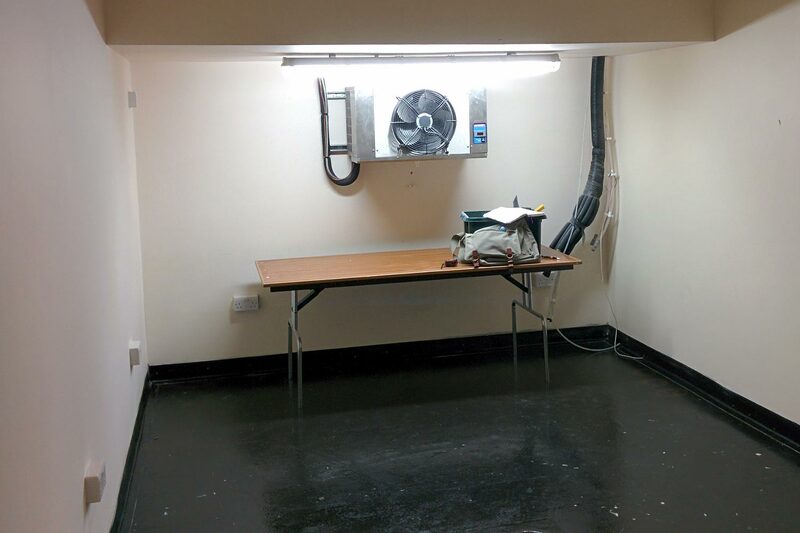 So, 3 months after starting we’d finally turned a disused beer cellar into a soundproofed, treated, fully functioning, ventilated music studio. The vision and work had more than paid off, with the room sounding amazing and the soundproofing working better than I ever dared hope. I can’t thank Ross Taylor enough -his acoustics and DIY expertise, not to mention his patience and ingenuity, turned my vision into a reality. So there we have it, the story of The Noisefloor’s creation. Since opening in March we’ve welcomed a steady stream of talented folk through the doors, from producers and composers to sound artists and voiceover actors. The Nosiefloor is providing a unique service for artists in Edinburgh who need affordable , flexible, professional sound studio space. We’re getting excellent feedback and all that remains is to spread the word – so please tell your friends about our facilities and membership schemes, like us on Facebook and follow us on Twitter. Thanks for reading, and see you at the studio!